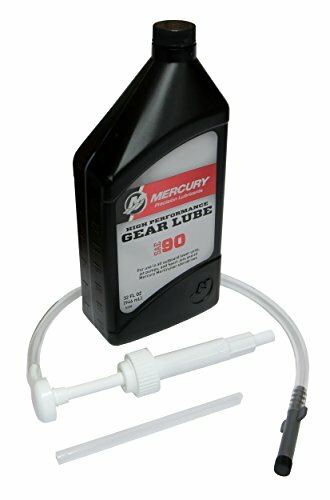 Mercury High Performance Gear Lube (32oz) with Hand Pump #91-8M0101435 Mercury Outboard's Gearcase Lubricant. Includes one quart of 92-858064K01 Mercury High Performance Gear Lube one 91-8M0072135 Quart Bottle Pump. May be used with any outboard which uses a 3/8"-16 drain/fill screw. Fits all MerCruiser sterndrives and Mercury/Mariner Outboards except those models of Japanese origin. If you have any questions about this product by Mercury Marine/Mericruiser, contact us by completing and submitting the form below. If you are looking for a specif part number, please include it with your message.